The history of the Oerlikon cannon has already been told on this site (HERE). Buried within it is an interesting story of a weapon which could have played a far more active role in the Second World War, had its potential been realised at an earlier date: the Oerlikon FFL. To recap, the origins of the Oerlikons go back to the 20mm Becker aircraft cannon of World War 1. Development of this was continued in the interwar years, first by SEMAG, then by Oerlikon. SEMAG introduced an additional model, the Type L, which used a longer cartridge case (20x100RB instead of 20x70RB) to achieve a higher muzzle velocity. Oerlikon added a third version, the Type S, with a longer and fatter case (20x110RB). These cartridges are illustrated HERE. By the mid-1930s the aircraft versions of the three types were designated Oerlikon FF, FFL and FFS. Little interest was shown in these cannon at first, the main user in the early 1930s being the French Air Force, which used versions of the FFS (known as the HS.7 and HS.9) in some fighters. The pace picked up in the late 1930s, with the German and Japanese Navy Air Forces selecting versions of the FF, and the UK (and subsequently USA) choosing the Type S as a naval AA gun. However, only the Japanese Navy Air Force made any significant use of the intermediate gun, the FFL, and although they developed it significantly, the only really competitve version did not emerge until too late in the Second World War. The early versions of the Type L (and the Type S) had a reciprocating sleeve, attached to the bolt and containing the recoil spring, which almost entirely enclosed the barrel. This model was developed in the early 1920s. A picture of this early version, on a flexible mounting, is HERE. The inertia of this mass of metal limited the rate of fire of the gun to about 350 rpm. Very few sales were achieved. 1. During the 1930s, Oerlikon radically modified the gun by replacing the reciprocating sleeve with a skeletonised yoke, to create the FFL. The weight was reduced from 43 to 34 kg (later reduced further to 30 kg) and the reduced inertia enabled the rate of fire to be increased to 490-500 rpm. This was the form in which the gun was adopted by the Japanese as the Type 99-2 in 1939 (the Type 99-1 being the Oerlikon FF), although they did not use it until late 1942. 2. The Japanese made various modifications to the gun but the first significant one came with the introduction of a belt feed in the Model 4: all Oerlikons were magazine-fed (as were the German MG-FFs with the exception of an electric-powered feed used by some night fighters). This was a considerable benefit to practical installations in fighters, as the 100-round drum magazine used before was very bulky. The cost seems to have been an increase in weight by 4 kg, much less than the weight of the belt feed developed for the Allied 20mm Hispano. 3. The next, and last, Japanese improvement was a significant reworking of the mechanism to increase the rate of fire, in the Model 5. It is probable that the yoke was further lightened and the mainspring weakened, because some powerful buffer springs were added to the back of the weapon. The idea seems to have been that the lighter yoke and mainspring allowed the bolt to be thrust back more quickly, while at the end of the recoil stroke the buffer springs kicked the bolt violently forwards. The net effect was an increase in the rate of fire to 675-750 rpm, plus probably an increase in the peak recoil blow (although given the recoil-smoothing effect of the APIB design, it would still have recoiled more smoothly than other types). This was an impressive performance, but the gun was too late to see action. A photograph of the Type 99-2 Model 5 is shown HERE; it is the lower of the two Type 99-2s, and the buffer springs are visible at the back. Oerlikon themselves did not further develop the FFL. However, they did work on the bigger and more successful FFS. By 1945 they had reduced its weight to 39 kg and increased its rate of fire to 650 rpm (from 400-470 rpm in the late 1930s). This indicates that they could have matched the Japanese achievements with the FFL. During the 1930s the performance of the ammunition was increased. 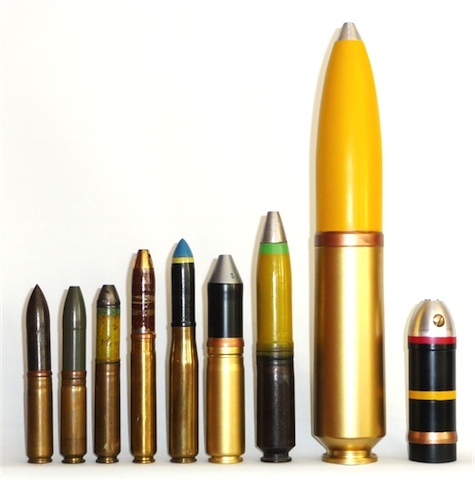 The shell weight of around 128g remained the same, but muzzle velocity was increased from 675-700 to 750 m/s. The calculations of effectiveness in this ARTICLE show that the ammunition had a "power score" of 15 (compared with 20 for the 20x110 Hispano). The gun power - just 120 for the Type 99-2 - would have been increased to 180 due to the improved rate of fire (720 rpm assumed), which compares with 200 for the Hispano Mk.II. Gun efficiency would have been even better, with a power-to-weight score of 5.1, compared with 4 for the Hispano. The neglect of the FFL by everyone except the Japanese is curious. The FF saw a lot of use, both by the Japanese and (in a slightly modified form) by the Germans, yet its low muzzle velocity seriously limited its effectiveness. The FFS also attracted interest, being used by the French, although the Type S was of course more popular as an AA gun. Compared with the FFL, it was much bigger and heavier. The FFL's muzzle velocity was significantly higher than the FF's, being a reasonable match for rifle-calibre MGs, yet it wasn't much bigger or heavier. To sum up, by the end of the war the Japanese had produced a gun which had a comparable rate of fire to the Mauser MG 151/20, but weighed less, had a smoother recoil push and fired more powerful ammunition. The main disadvantage was that it was inherently unsuited to being synchronised to fire through the propeller disk, so it could not be mounted in a single-engined fighter's engine cowling or wing roots. None of the improvements made to the FFL were technically difficult, and they could all have been introduced at any time in the gun's development history if the need had been identified. By comparison with the early war version of the 'ideal' WW2 20mm gun discussed HERE, the fully-developed FFL would have been very similar; the cartridge was equally powerful, the rate of fire much the same, the weight probably slightly less (no more than 35 kg) and the recoil effects easier to manage. The disadvantages would have been the inability to synchronise the gun (not an issue in British or American practice) and the probable inability to raise its rate of fire later. Of course, the effectiveness of the gun would have been further increased by the adoption of lighter, more streamlined Ausf.C type M-Geschoss as proposed for the 'ideal' gun. Assuming a 105g shell with 20g HE, fired at 850 m/s, this would have a cartridge power score of 26, giving our uprated FFL a gun power of 312 and a gun efficiency of 8.9; significantly better in all respects than any actual wartime 20mm gun. The SEMAG/Oerlikon Type L was on commercial sale, to anyone who wanted it, from the early 1920s onwards. Any nation with a reasonably competent gun industry could at modest cost have acquired the gun and developed it in the way described. 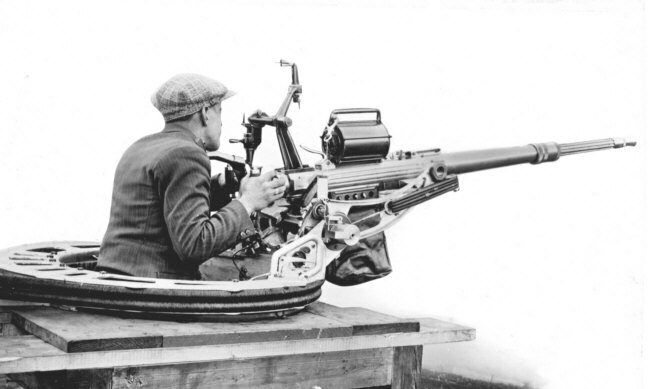 In particular, the British were testing the bigger Oerlikon S in the late 1920s/early 1930s (including, interestingly, a belt-fed version). Had a British company decided to acquire and develop the Type L then, they could have had a highly competitive 20mm cannon in service for the start of WW2. By comparison with the Hispano Mk II, it would have been less powerful but faster firing, much lighter and more compact, and caused fewer recoil-induced installation problems. It also would have been available in time for the Battle of Britain.